Alambik was not only developed for the web. In fact, it was just recently ported to the Windows platform. Initially, the three screens concept applied to a specific ASIC. 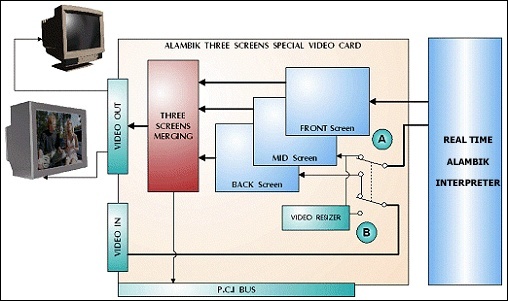 This piece of hardware copied, through the Video Bus, the three Alambik "screens" onto three corresponding hardware plans (RGB back, RGB mid and RGB). Then, it would process the graphical opacity and transparency, superimposing the three RGB plans and sending the merged frames to a digital/analogic converter. We have preserved this concept in the ported Windows version of Alambik by emulating these three hardware plans - which we will refer to as the three "Alambik screens." Each of the three Alambik screens can manage up to 65,535 layers. The names of these screens are: MID, BACK and FRONT. By default, you script into the middle screen (MID). The three Alambik screens get created with the instruction screen.set and are refreshed only after they have been created. You will therefore want to decide whether to use all three screens (for example, if you are doing video post production and want the video signal to be displayed in the BACK screen, graphic elements to be added in MID, and FRONT to be used for the foreground) or just one or two screens (in order to optimise refreshment calculation). With screen.set you can also designate a bitmap image to become the target of all graphic processing until the instruction screen.end is called. For example the instruction picture.display, when used after screen.set (@ObjectID_2D_object) will display a picture in the graphical frame of a 2D object.